This vivid autobiographic book, by Olivia Andrade-Lage, reveals the experiences of a young Portuguese-American girl living on a California Central Valley dairy farm through the Depression years. It depicts her thoughts and feelings, her family environment, the routines of farm life, the experiences of school and work in a small rural town. It also portrays the struggle of a young girl to overcome family restrictions and realize her dreams through education. 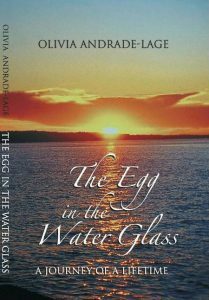 The Egg in the Water Glass is a unique story of one family set against the backdrop of the southern San Joaquin Valley of California. It traverses major epochs of American history: The Great Depression, World War II, and the Cold War. It depicts the personal triumph of a Portuguese-American girl in a patriarchal society who through education achieves her dreams.